Do you need a way to handle event registrations? Are you looking to collect information without using snail mail? Using an RSVP form can simplify your event management needs. In this article, we’ll show you how to create an RSVP form in WordPress. Why Use an RSVP Form? Your time is limited. Spending time opening letters in the mail, jotting down the details, and then compiling all the data together isn’t efficient. Not to mention, making the RSVP process easier for your guests should be your top priority. You’ll get a higher response rate by sharing a link to confirm rather than tasking them to send their replies via snail mail. If you have a WordPress site, you can quickly get all the information you need in an organized format with an online RSVP form. Birthday party – Get a quick headcount of attendees. Wedding – Ask for additional details like meal preferences. Business event – Accept registrations and even sell tickets on your RSVP form. So, let’s see how to create an RSVP form in WordPress. Using WPForms is the easiest way to create an online RSVP form in WordPress. WPForms comes with the Form Templates Pack addon that allows you to choose from a huge variety of pre-built templates for every niche and industry, including tons of different online RSVP form templates. To do this, go to WPForms » Add New and name your form. 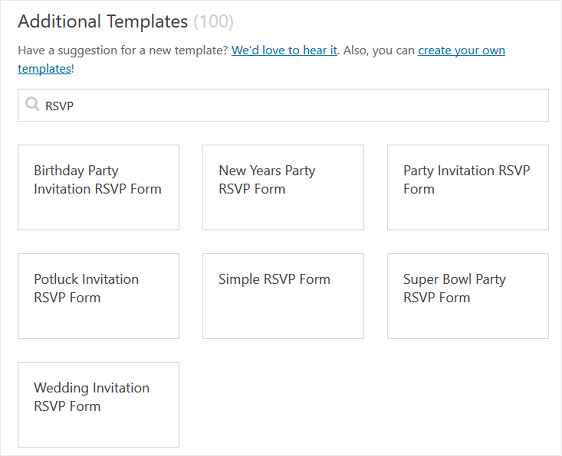 Then, scroll down to the section labeled Additional Templates and type “RSVP” into the search bar. In our example, we’ll choose the Birthday Party Invitation RSVP Form. How many people are you going to bring? Then, click on the field to make any changes. You can also click on a form field and drag it to rearrange the order on your RSVP form. If your RSVP form is for a business event, you can request attendees to pay for their tickets when they RSVP. WPForms allows you to accept payments on your forms using either Stripe or PayPal. You can read our documentation on how to allow users to choose a payment method if you want to use both integrations on your form. 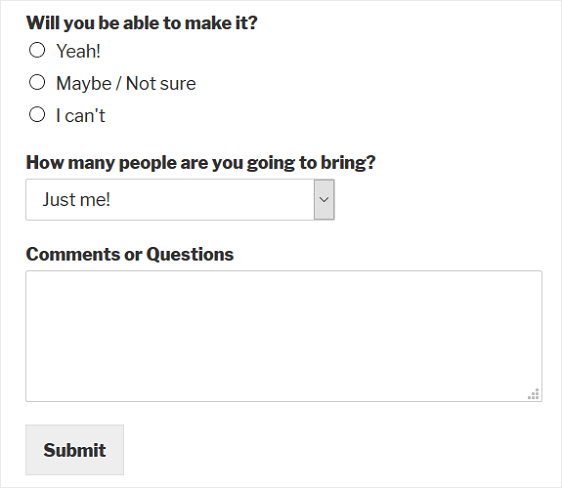 When your RSVP form looks the way you want it to, click Save. Spam Prevention. Enable the anti-spam honeypot feature to prevent spam form submissions and keep your website secure. This feature is automatically enabled on all WordPress forms. If you decide to use another form of spam prevention, you can either unclick this option or continue using this feature with other spam prevention features such as recaptcha. GDPR Enhancements. You can disable the storing of entry information and user details, such as IP addresses and user agents, in an effort to comply with GDPR requirements. In addition, check out our step by step instructions on how to add a GDPR agreement field to your simple contact form. Notifications are a great way to send an email whenever an order is submitted on your website. In fact, unless you disable this feature, whenever someone submits an RSVP form on your site, you’ll get a notification about it. If you use smart tags, you can also send a notification to the site visitor when they RSVP to your event, letting them know you received their RSVP and will be in contact shortly. This assures people their form has gone through properly. 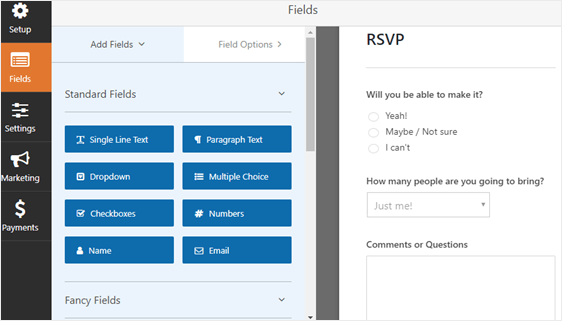 WPForms lets you notify the right person in your organization when an RSVP form is submitted. For instance, you can send a notification to yourself, your attendee, and the event coordinator in charge of meals. 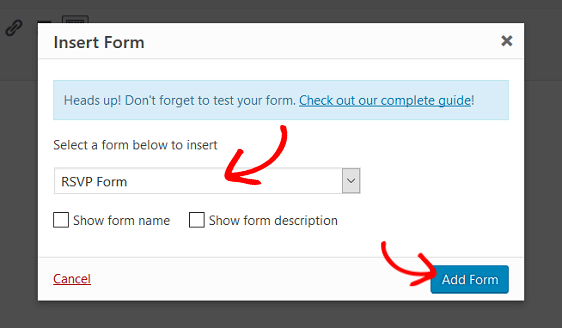 Form confirmations are messages that display to site visitors once they submit an RSVP form on your website. They let people know that their form has been processed and offer you the chance to let them know what the next steps are. Message. This is the default confirmation type in WPForms. When someone submits an RSVP form, a simple message confirmation will appear letting them know their form was processed. Look here for some great success messages to help boost customer happiness. Show Page. This confirmation type will take site visitors to a specific web page on your site thanking them for their RSVP answer and telling them when you’ll be in touch with help. For help doing this, check out our tutorial on redirecting customers to a thank you page. In addition, be sure to check out our article on creating effective Thank You pages for boosting customer loyalty. 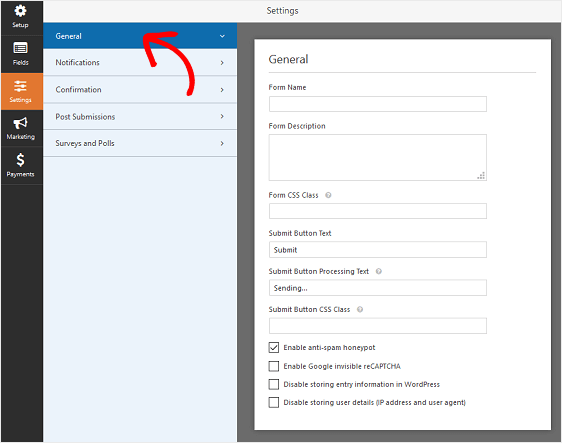 Let’s see how to set up a simple form confirmation in WPForms so you can customize the message site visitors will see when they RSVP to your event. 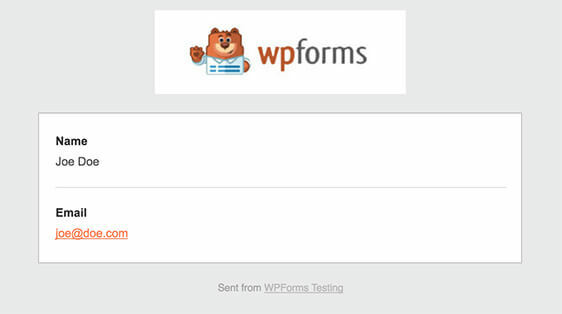 WPForms allows you to easily connect your WordPress form with your favorite third-party app using our Zapier addon. In fact, the Zapier addon lets you connect your WordPress forms to over 500+ web apps. For example, you can connect your form with your Google Calendar with ease. That way, any time someone RSVP’s to your event, the information on the form will automatically add to your calendar. To see how to do this, check out this article on how to connect your form with Google Calendar. After you’ve created an RSVP form, you need to add it to your WordPress website. Next, select your order form in the modal popup and click Add Form. Then, publish your post or page so your RSVP form will appear on your website. And there you have it! You now know how to create an RSVP form in WordPress. You can connect your RSVP forms with your email newsletter services such as AWeber, MailChimp, Constant Contact, GetResponse, Campaign Monitor, or Drip to automatically add new users to your email list and send out updates about your upcoming event. Can you integrate a liability waiver into the form when someone registers or books an event? This is for a place of business where we want our customers to book a party, invite their guests and sign a liability waiver per invitee. Sure, you can definitely add an agreement like this to a form. If you check out our doc on adding terms of service, you’ll see a couple of methods you could consider. You could also add a Signature field, so the user could sign their name with their mouse/touch screen (this addon is included with our Pro license or higher). Is it possible to create a drop down guest list so invitees can select their name and then either accept or decline? Sure, you could create a dropdown field with a list of all of your guest’s names. If this is a long list, you could use our Bulk Add tool to more easily add all names at the same time. Is it possible to restrict the number of guests each company is registering for? For example, once five people from one company register, any additional people will be unable to register. It sounds like our Form Locker addon might be helpful to you. With it, you can limit the number of forms that can be submitted (here’s our tutorial with more details). So as long as you only allow one person to register per form, this would work just as you’ve described.